From an energy use standpoint, the May-September period is the primary period when cooling demand dominates, while November-March is the period when heating demand dominates. The in-between months of October and April tend to be more moderate, though still usually see more heating demand than cooling demand. This year, after a variable, but close to average winter season, the US saw an extremely cold April, followed by an abrupt switch to hotter weather at the start of May. Since then, temperatures have remained above normal across the US nearly every day, with only a handful of below normal days on a national basis during that time. 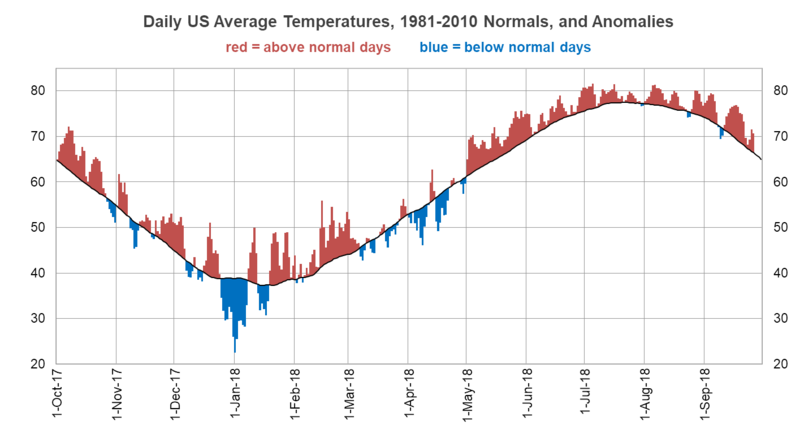 The following plot shows population weighted US temperatures along with the 30-year normal (black line) and the daily temperature anomalies in red and blue. The sharp switch from colder weather in April to warmer weather around May 1st is quite evident on the plot. A common index used when modeling energy demand in the summer is population-weighted cooling degree days (CDDs). The daily CDD values are the difference between the average daily temperature and 65°F for individual cities across the US, with any average less than 65° resulting in 0 CDDs for the day. That baseline temperature is used since it represents a minimum of heating and cooling demand in most areas of the country. The daily CDD values for different locations across the country are then weighted based on population at those locations relative to the population of the entire country to produce a US average. This number effectively represents an average weighted to where people live, and so conditions in mostly unpopulated areas of the interior West or High Plains have less impact on the values. When those daily values are summed up for the entire May-September period, the results for this year are quite stunning. May-September 2018 had far and away the largest population weighted CDD total of any year in our database, and since 2016 was the warmest summer on record going back to the 1800s in NOAA’s data, that implies this warm season ranked highest overall since then as well. The June-August period wasn’t quite as hot as 2016 and ranked 4th hottest on record since 1895, but the record hot May this year and an extremely warm September have pushed the May-September totals to record levels. 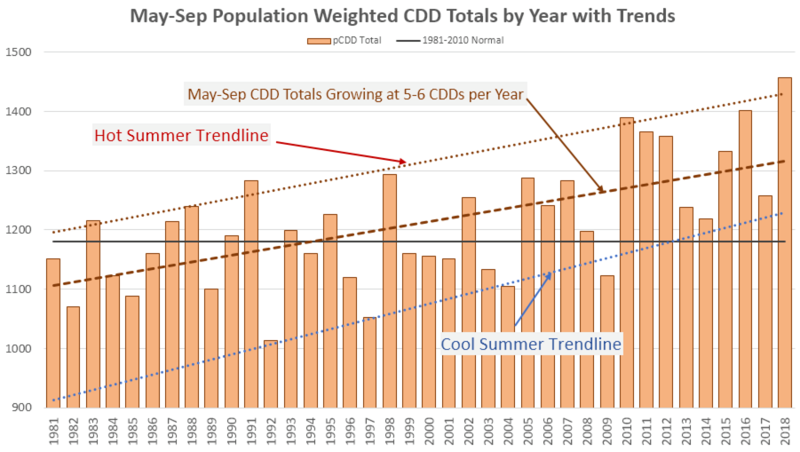 Note in the following chart that not only have the CDD totals been trending higher in general, but cooler summers are trending warmer as well. In the winter season, there has been a strong warming trend in warm winters, but cold winters have remained pretty consistently cold over time as the following chart shows. 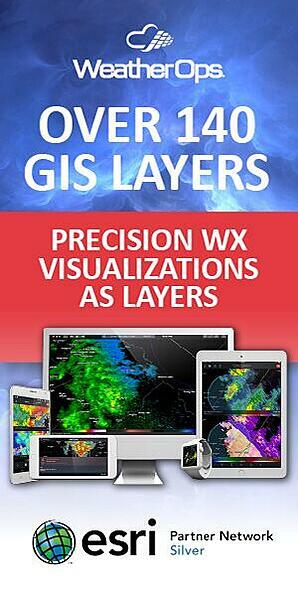 Summers have been different with both the cooler and hotter summers trending warmer at about the same rate. The net result being that hotter summers are becoming increasingly likely, while cool summers, relative to the 30-year average, are now much less likely to occur. 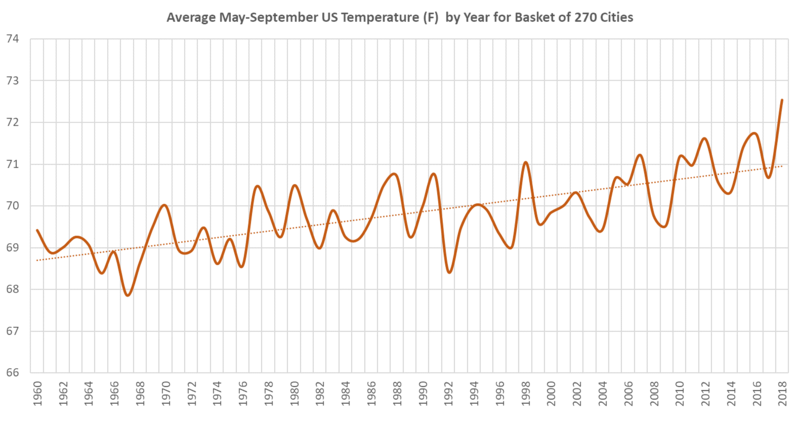 If we look at a simple average of the 270 observation sites we have in our database that have records going back to 1960, the same strong warming trend is seen in the data with May-September 2018 again ranking much higher than any other year. 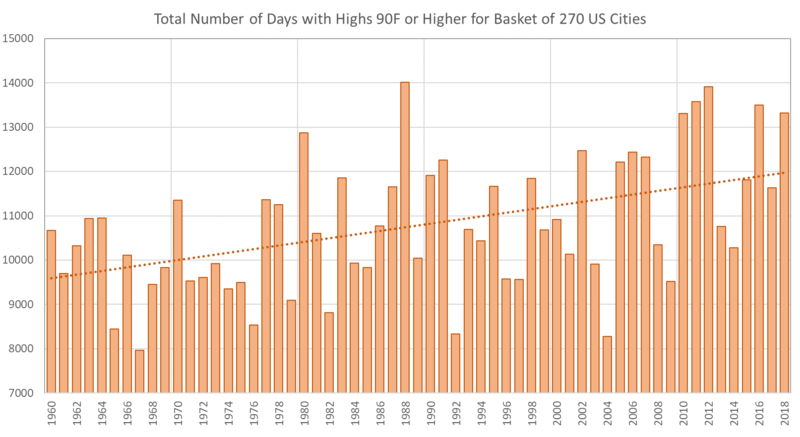 While this May-September warm season was the hottest on record as measured by average temperature and CDD totals, it was not the hottest based on the number of 90°F days or 100°F days. When looking at 90°F days, 2018 only ranks 6th highest thus far (these plots show calendar year totals), and while the total will increase a little going forward, most areas of the country are now done with 90°F weather. 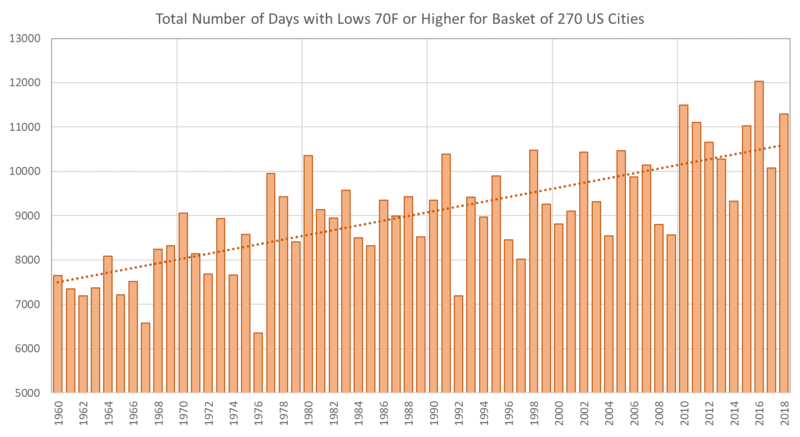 The trend in the number of warm low temperatures over 70°F is more consistent and shows a stronger upward trend than the data for 90°F days. While June-August 2018 was 4th hottest on record based on the average temperature, it was warmest on record based on average low temperature. In summary, summer temperatures have been trending steadily warmer across the US, and that trend is likely to continue in the coming years. But, much of that warming is occurring at night, and extreme daytime heat hasn’t increased quite as quickly. Regardless, the warming trend in summer temperatures combined with increasing US population means that summer electricity demand for powering air conditioners will continue to grow as well. While natural gas production has been increasing this year in the US, rising electricity demand from the persistent strong heat this summer soaked up that extra supply (which was used to produce more electricity at natural gas-fired power plants) and natural gas storage levels are now further behind the five-year average than at the start of the summer season. 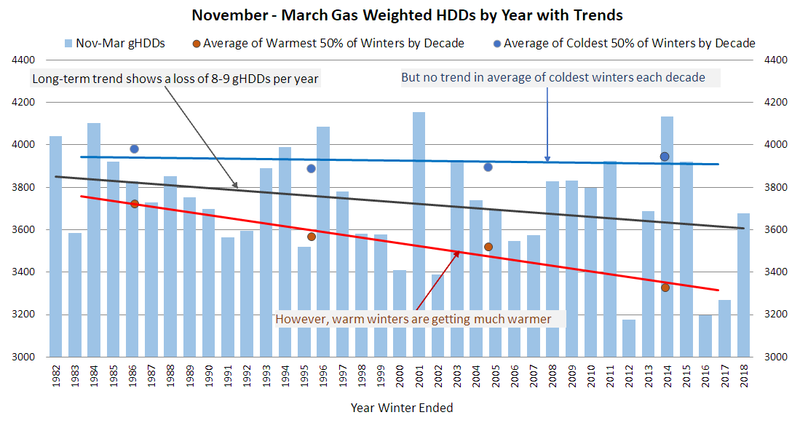 If this upcoming winter is mild, then natural gas storage levels will increase back towards average levels, but a repeat of an extremely cold winter like 2013-14 will make for an interesting natural gas supply situation by late winter.